Sadly these days, most people eat a wrong kind of diet, with bad combinations and processed foods. We believe the right kind of food with right combination and proper balance is the best fuel for your body. Here comes in our 80 / 20 rule. According to the many years of research and clinical findings, by eating 80% alkaline and 20% acidic foods, your body sustains its own proper alkaline and and acid reserves. food additives, preservatives, colorings, artificial flavorings, MSG or trans-fats. understanding if it takes us a bit longer.Bon Appetit! Sianji is located in Kadıkale Region of Bodrum, situated 3 km from Turgutreis Town surrounded by islands of Kos and Kalimnos by the west end of Bodrum. They are 3 km from Gümüşlük. The land of the Sianji is at the seafront between the Kadıkale Resort Hotel next to the historical Kadıkalesi and the Yasmin Resort Hotel. It is built on approximately 100 acres of usage area with green areas. The gentle slope of the land enabled all the rooms of the residences to overlook the garden and the sea. The parts of the residences that do not overlook the garden and the sea were built in a way to have a lake view. All the other parts were left as green areas or turned into sports fields. The luxury suites and villas are prepared for joy and comfort of the guests. Junior Suite : The smallest suite in the resort, 50-70 m2 .Seaview is not guaranteed in this room type. Seaview Suites : 80-92 m2,spacious suite featuring a private hot tub and luxurious bathroom amenities. Poolview Villas : 101 m2, duplex villa featuring a private terrace opening out to the pool area. 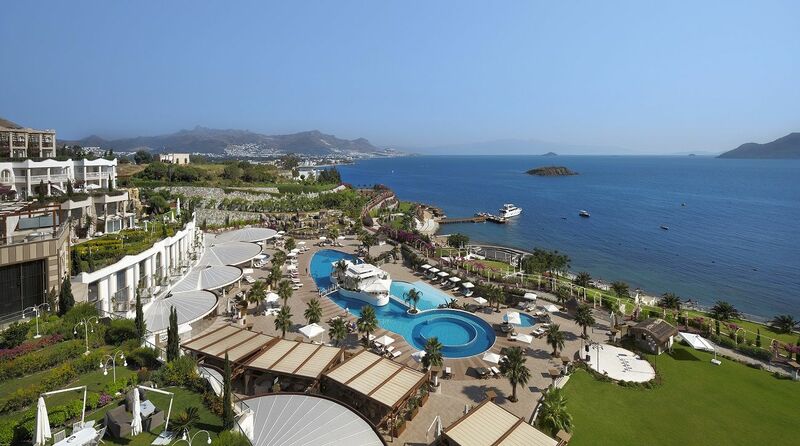 Sianji is located in Kadıkale Region of Bodrum, situated 3 km from Turgutreis Town surrounded by islands of Kos and Kalimnos by the west end of Bodrum.